September 15th-25th In/Future @ Ontario Place (West Island), 955 Lakeshore Blvd. W. A transformative art experience featuring 60+ notable Canadian and international artists and 40+ musical acts working in different mediums exploring themes of time, history, and change. The festival celebrates diversity in art and music through an 11-day conversation with Toronto about what our future could be. September 20th-29th Canada’s Walk of Fame Festival @ various locations. A seven-day showcase of Canadian arts featuring more than 45 acts performing at the Mod Club, Phoenix Concert Theatre, Horseshoe Tavern, and Yonge-Dundas Square. Festival performers include Black Mountain, Classified, Delhi 2 Dublin, Great Lake Swimmers, Matt Dusk with special guest Florence K, Zeus, and more. September 24th-25th North Toronto Floral Market @ CF Shops at Don Mills, 1090 Don Mills Rd. An outdoor flower and plant market filled with a wide selection of florals, herbs, seeds, and sweet treats, curated with a Parisian flare by pickOntario and Toronto Botanical Garden. Runs 12-6 pm both days. 6 pm Reel Girl Talk Presents: 9 to 5 @ Carlton Cinema, 20 Carlton St. The MUFF Society kicks off their fall programming with something shiny and new: Reel Girl Talk, a discussion-based screening series. Meet in the lobby at 6 pm for traditional MUFF photobooth fun, then head into the theatre for a screening of 9 to 5 (produced by Jane Fonda, written by Patricia Resnick and featuring music by Dolly Parton), followed by a panel on equality (or the lack thereof) in the workplace. $15 advance tickets available online. 6:30 pm Harvest Wednesdays @ The Gladstone Hotel, 1214 Queen St. W. Harvest Wednesdays seeks to connect urbanites with rural producers and spark conversation about Community Shared Agriculture, eating locally for global change and of course, enjoying seasonal Ontario produce, harvested just the day before. Each event features notable guest chefs, inspiring community speakers, produce from Chick-a-biddy farms, local wine partners, and more! This week features a series of small bite courses prepared by Chef Katie Venables Llyod with special drinks to match prepared by Collingwood Whisky. $40 tickets available online. 8 pm Get/Off: Offsite Launch Party @ Offsite, 867 Dundas St. W. A night celebrating fashion, art, and style! Featuring a fashion show with designs from Brit Wacher, Som Kong, Sera Ghadaki, Ruzica, YYY, and Alice Yujing Yan; an art exhibition by Ann Lin, Sabrina Shen, and artists in residence Vessna Perunovich and Micheal Boehm; music by Young Teesh; and more. 8:30 pm Mean Girls Quote-Along @ Hot Docs Ted Rogers Cinema, 506 Bloor St. W. Comedian Steph Tolev hosts a raucous screening of the pop culture phenomenon that taught us about The Plastics, freshmen, preps, desperate wannabes, burnouts, sexually active band geeks, and fusion nerds. Doors at 8:30 pm, screening at 9:30. Advance tickets available online. 10 pm Sympathy For The Devil @ Swan Dive, 1631 Dundas St. W. DJ Waves takes over Swan Dive for the night to throw the loudest, craziest, rock ‘n’ roll party in town! Get down to the sounds of surf, garage, psychedelic, rockabilly, stoner, and everything in between. 10 pm The Big Sound @ The Great Hall, 1087 Queen St. W. Toronto’s finest celebration of the golden era of soul and Motown returns to throw down their next foot stompin’, heart pumpin’, sweet lovin’ soul party! Featuring BIG renditions of the BIG classics guaranteed to make you shout and shake. And as always, you can dance the night away to the originals before and after the set as spun by DJ Wes Allen and Matt Cully. $15. 10 pm Saddle Up @ Owl’s Club, 847 Dovercourt Rd. Get that old country feeling in the heart of the city at Saddle Up! It’s a dance party in a legion hall, with legion hall drink prices. Stomp to the sounds of Dolly, Willie, Loretta, and more – they play all the good tunes, and only the best of the bad ones. There will be a coupla line dances, the occasional slow song, and no bro country. $5. 10 pm Whatcha Saying? @ Bambi’s, 1265 Dundas St. W. It’s Friday night / Boys and girls feel alright / That music we be playin’ / So tell us… Whatcha Sayin? Your DJs: Raf Reza and Dean Feeney. $5. 10 pm Feministry @ ROUND Venue, 152-A Augusta Ave. A project growing from music, fashion, writing, conversation, ideas exchange, centred by intersectional feminism; acknowledgement of difference, assertions of love and respect. Featuring Mamalia (live set), DJ Shi Shi, Cam Lee, and Buzz Buzz playing techno, house, and weird stuff. PWYC or $5 before midnight, $10 after. 10 pm Jamz @ Clinton’s, 693 Bloor St. W. Mad ’90s dance party with pals Slater and Ty! $5. 10 pm Gotta Pay The Rent: Fade To Black @ The Beaver, 1192 Queen St. W. After 22 events over three years, Gotta Pay The Rent is going dark. Indie electronic tunes by Casual Adam and Matt A, one last time. 10 pm All That @ The Boat, 158 Augusta Ave. A ’90s night like no other! DJs Streets and LK play mostly hip-hop, dirty R&B, and club kid jams. $5. 10 pm Get Buck @ The Ossington, 61 Ossington Ave. Hip-hop, soul, RnB, soca, dancehall, and deep grooves with DJ Nino Brown. 10 pm Fast Times @ The Piston, 937 Bloor St. W. DJs Tweed and Babe Decibel play the best ’80s new wave, pop, rock, funk, and electro-pop for your aural pleasures. Let out your inner nerd self for this one and remember – it’s ’80s stuff, so dance like nobody’s watching. 11 pm Get Good @ The Drake Underground, 1150 Queen St. W. Diggy The DJ (Down With Webster) plays all your favourite bangers. $10. 10 am Etsy: Made In Canada @ MaRS Discovery District, 101 College St. The third annual flagship Etsy: Made in Canada show, co-hosted by the Toronto Etsy Street Team and 416Hustler. Featuring 130 top handmade and vintage Canadian Etsy sellers! Until 6 pm. 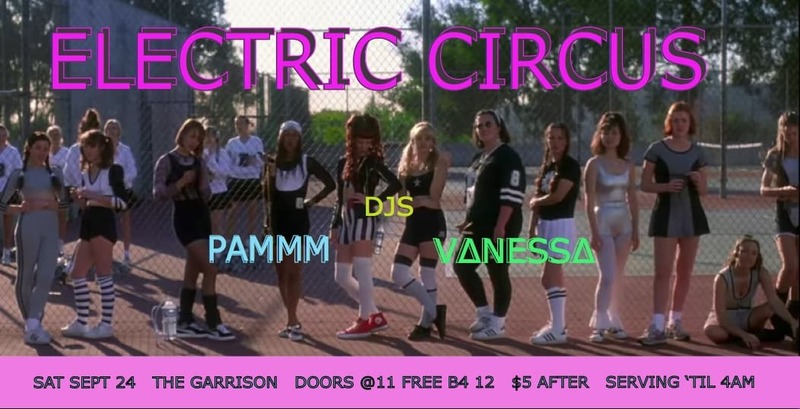 10 pm Electric Circus @ The Garrison, 1197 Dundas St. W. DJs Pammm and Vanessa are gonna making you sweat! Playing all your favourite ’80s and ’90s house music and dance floor jams. Free glowsticks (while supplies last). 4 AM LAST CALL. Free before midnight, $5 after. 10 pm Tenderness @ The Emmet Ray, 924 College St. DJ Roberto Pinto Jr. and special guests Josh Sherman and Patrick Ledgar dropping wax all night long for your boogie body and listening pleasure. Disco, funk, soul, boogie, and classic house. 10 pm Bring It On: A 2000s Dance Party @ Sneaky Dee’s, 431 College St. The world of cheerleading crashes full-force into the world of Sneaky Dee’s! Torrance and the Toros are going up against the Clovers and there will be dance battles happening. Expect to hear all the dance party jams from the 2000s as well as some some cheerleader anthems. 4 AM LAST CALL. $5 at the door and online (includes line bypass). 10 pm Juicebox @ The Piston, 937 Bloor St. W. Indie hits dance party with DJs Tweed and Babe Decibel. The Strokes, Bowie, Arcade Fire, New Order, LCD Soundsystem, and more! $5. 10 pm Pick Up The Phone @ Lily, 656 College St. Summer’s over, but it’s one of the best months of the year for new music. New Thugger, Travis, Rihanna, Beyonce, and all the other good stuff with DJs Aphilyaded and Marko Orlic. 10 pm Whatevs @ Unlovable, 1415-B Dundas St. W. ‘90s to present rap and RnB dance party. Old and that new-new, guaranteed to make ya get down. Loose morals in effect. 10 pm Hey Girl Hey @ The Steady, 1051 Bloor St. W. Do Saturday night right with a hip-hop and R&B dance party for queers! DJ Orange Pekoe playing your fav all-female jams + Drag-Queen-in-Residence Beardoncé slaying you at 12:30. Free before 11 pm, $5 after. 10 pm F’unreal @ The Boat, 158 Augusta Ave. Music for your dancing pleasure with pals Well Said, Slater, L-Sos, Kek, and Ty. $5. 10 pm Love Below @ Bambi’s, 1265 Dundas St. W. Music made by machines (and people) moving in slow motion. Codeine techno + hypno house + subterranean atmosphere with DJ Andrew Ross. $5. 10 pm Panic @ Remix Lounge, 1305 Dundas St. W. The ultimate retro party with DJ Lazarus spinning the kind of retro that changed your life. ’80s, ’90s, new wave, classic alternatives, ska, Brit-pop, dance, shoegaze, post-punk, and more. This month’s spotlight is Echo and the Bunnymen. $5 before 11 pm, $10 after. 10 pm Dutty @ The Shop under Parts & Labour, 1566 Queen St. W. Dutty is a predominantly dancehall and reggae party. Think basement vibes and early 2000s. Music by Sailor Gerry and DJ Jenno. $5. 11 pm Itzsoweezee 6 Year Anniversary @ The Drake Underground, 1150 Queen St. W. A feel-good house party atmosphere celebrating six years in the 6ix! DJs Tom Wrecks, DeMiggs, and ΛV play music to make you dance, smile, and holler. For line bypass before midnight, submit names here (right side of the page). $10. 10 am Christie Crawlfest @ Christie Pits Park, 750 Bloor St. W. Toronto’s first-ever #Crawlfest, co-hosted by the David Suzuki Foundation, The Laneway Project, Bells on Bloor, and Friends of Christie Pits Park. 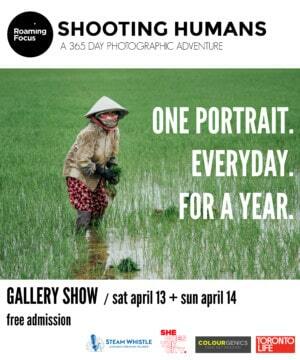 Featuring musical performances, food and drink, art, and more! Limited number of food tickets available online in advance ($25 for five tickets). Please bring your own plates and mugs. Until 6 pm.